The latest monthly QV House Price Index shows that nationwide residential property values for April increased 11.1% over the past year, which is the slowest annual rate of growth since July 2015. Quarterly value growth plateaued with a 0.0% change over the past three months. This means nationwide average value remains at $631,147 which is 52.3% above the previous market peak of late 2007. When adjusted for inflation the nationwide annual increase drops slightly to 8.7% and values are now 27.2% above the 2007 peak. Residential property values across the Auckland Region increased 10.7% year on year which is the slowest annual rate of growth since December 2014 and quarterly growth decreased by 0.4% over the past three months. The average value for the Auckland Region is now $1,043,830 and values are now on average 91.0% higher than the previous peak of 2007. When adjusted for inflation values rose 8.4% over the past year and are 59.4% above the 2007 peak. Values across the Auckland Region are continuing to show a slight drop of 0.4% over the past three months. Values on the North Shore, Waitakere, in parts of Manukau and Auckland City central suburbs decreased during the quarter, while values continued to rise in Papakura, Franklin, Rodney and Waiheke Island. Hamilton home values are rising again with values up across all parts of the city over the past three months. Overall values for Hamilton city have risen 14.4% year on year and 1.4% over the past three months and they are 49.1% higher than the previous peak of 2007. The average value in the Hamilton is now $538,832. The rate of value growth in the Tauranga market has been slowing since the introduction of the LVR restrictions late last year and this trend has continued over the past three months, with value up just 0.9% over the past three months. Values there rose 17.5% year on year and they are now 40.9% higher than the previous peak of 2007. The average value in the city is $678,643. Meanwhile, the Western Bay of Plenty values have increased 15.9% year on year and 2.7% over the past three months. The average value in the district is now $590,783. QV homevalue Tauranga, Registered Valuer, David Hume said, “Agents are reporting more normalised activity in the sub $700,000 bracket. 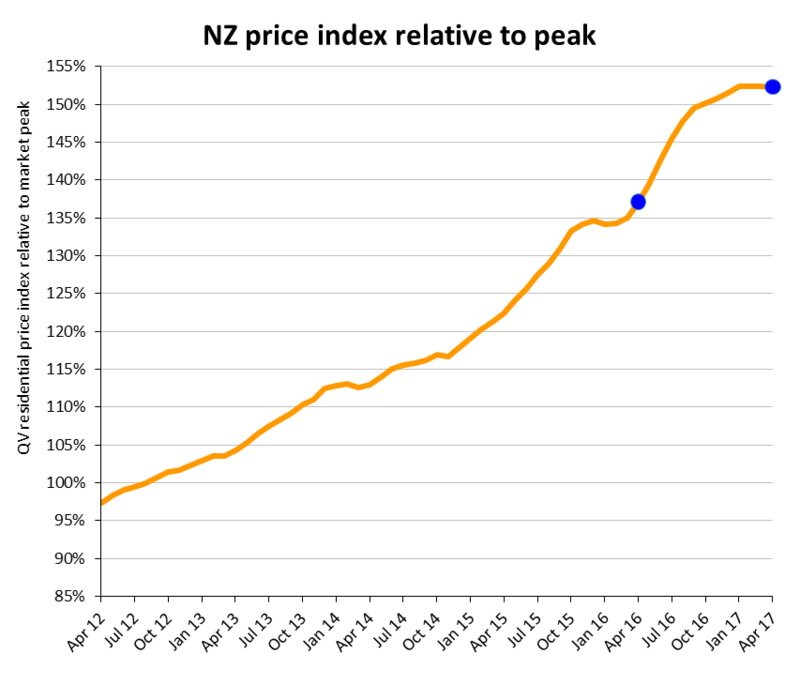 The QV House Price Index shows values across the Wellington region continued to rise up 21.2% year on year and 3.4% over the past three months and values are now 32.2% higher than in the previous peak of 2007. The average value across the wider region there has now topped $600,000 and is $602,230. Wellington City values rose strongly over the past year up 20.8% and 3.1% over the past three months and the average value there is now $724,176. The Hutt Valley is still accelerating with Lower Hutt values up 25.1% year on year and 4.3% since February; Upper Hutt is up 26.6% year on year and 2.8% over the past three months. Porirua values are up the most over the past three months rising 5.5% since February and 24.4% year on year. The average value there is now $510,853. Meanwhile, values on the Kapiti Coast are also continuing to rise up 20.9% year on year and 1.8% over the past three months. Home values decreased slightly over the past three months in most areas of Christchurch City with the exception of the Waimakariri District and the Christchurch – Hills suburbs where values were up 1.6% and 0.8% respectively since February. Christchurch City values increased 1.4% year on year and they are now 30.7% higher than the previous peak of 2007. The average value in the city is now $495,855. The Dunedin market continues to be buoyant with city home values rising 17.0% year on year and 3.5% over the past three months and values are now 29.9% above the previous peak of 2007. The average value in the city is now $371,739. Nelson home values continue to see good value growth rising 16.9% year on year and 3.8% over the past three months. The average value in the city is now $527,422. Values continue to rise in the Tasman District up 16.9% year on year and 4.7% over the past three months. The average value in the district is now $521,575. Napier values are up 17.2% year on year and 1.5% over the past three months. The average value in the city is now $425,484 and values are now 25.0% above the previous peak of 2007. The Hastings market continues to see strong value growth up 22.8% year on year and 4.2% over the past three months and the market is now 31.1% higher than 2007. The average value there is now $408,510. In provincial areas of the North Island, regional areas in relative proximity to Auckland continue to see values accelerate with the Kaipara and Thames Coromandel Districts now seeing value growth of more than 6.0% over the past quarter and more than 22.0% year on year. Opotiki in the Bay of Plenty has also seen values jump rising 14.9% over the past three months and 26.3% year on year. The only areas in the North Island to see values decrease over the past three months were parts of Auckland, Stratford and Waitomo. In provincial areas of the South Island, the MacKenzie District again saw the highest percentage growth with values up 8.3% since February and while quarterly growth in the previously hot Queenstown market slowed to 0.9%. The only area in the South Island to see values decrease over the past year was the Grey District where values were down slightly by 0.1% and over the past quarter values dropped in parts of Christchurch as well as the Grey, Hurunui, Selwyn, Ashburton, Timaru, Waimate, and Clutha Districts.